PANGONG LAKE in Ladakh, an expanse of water at an altitude of some 4,350 metres in Indiaâs far Himalayan north-west, is a sublime sight. Surrounded by snow-capped peaks, its icy water is so blue and clear that you can see far down into its depths. Yet these days, the lakeâs edge (pictured) has a new attraction. Along the shore sit a dozen or so scooters, spaced about ten metres apart, as well as a few plastic chairs in three colours, shaped in the form of menâs bottoms. For 30 rupees ($0.41) each, tourists can take pictures of themselves mounted on these props. âThis is the signature shot,â enthuses Vivek, an engineer from Delhi, as he clambers on a yellow scooter. 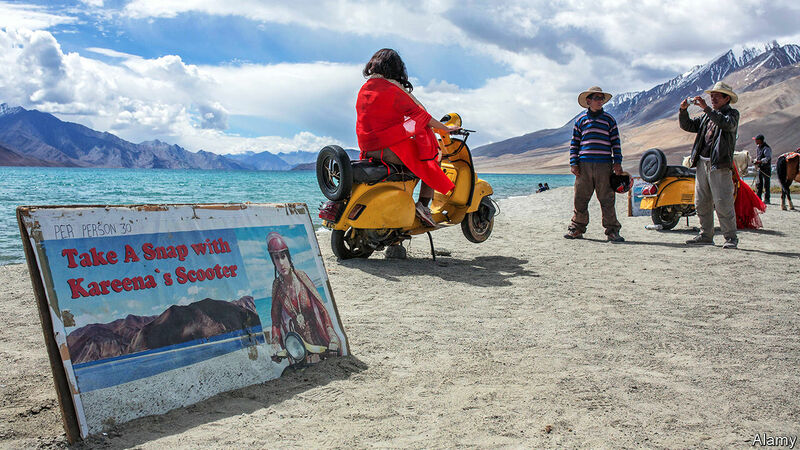 Until a few years ago, few tourists made it to Pangong lake; those who did were mostly intrepid Western backpackers. The road to get there, which crosses the worldâs second-highest drivable mountain pass, is a hair-raising icy strip built to ferry soldiers to guard the border with China. But that has changed, in large part because of Bollywood. In 2009, â3 Idiotsâ, a comedy film with Aamir Khan, among Indiaâs favourite actors, featured a scene at the lake and another with the chairs. In 2012 that was followed by âAs Long As I Have Lifeâ, a romance involving Pangong. Now the men in khaki share the road with minibuses full of camera-wielding tourists. Your correspondent was press-ganged into selfies with a crowd of Mumbai office workers. According to the government, the number of domestic-tourism trips taken annually by Indians grew almost eightfold between 2000 and 2017, to 1.65bn. An unmeasurable but significant chunk of that is due to Bollywood. A 14th-century stepwell in Delhi, as featured in âPKâ, another of Mr Khanâs films, is thronged with selfie-takers, as is another centuries-old stepwell in Rajasthan. Old forts in Rajasthan and in Goa have far more visitors because of their role in films. Even locations outside India are benefiting, sa ys Jay Kantawala, who runs Wiyo Travel, an upmarket-travel agency in Mumbai. Budapest is a particular favourite, thanks to âI Have Given My Heart Away, Darlingâ and âWhen Harry Met Sejalâ, two romances. One of the more unlikely destinations is a 45-year-old plane wreck in Iceland, which was featured in âDilwaleâ, a romantic-action movie that came out in 2015. Promoting tourism is hardly what filmmakers set out to do. But Indian state tourist boards have cottoned onto the benefits of their landscapes and buildings appearing on screen. In return for filming in new spots, directors increasingly expect things like permits and security to be sorted out smoothly. Airlinesâ"another of Indiaâs fastest-growing industriesâ"promote new routes by reference to films shot nearby. There are downsides. Near Pangong, touristsâ litter is beginning to pollute the source of the Indus river. The flow of traffic, and cars which travel up to the lakeâs edge, may be damaging a delicate and near-pristine habitat. Perhaps the next film set there might contain a little encouragement not to wreck the area.